Home/Reviews/Archive by Category "As Seen On TV"
Handy Can Opener – This product claims that “With one touch this battery operated can opener “walks” around the can and then shuts off automatically” and it does exactly that. I tried different size cans ever since receiving this product, and it worked every single time with every style of can. So after testing it many times I finally made a video using it to open a can of tuna prior to making a tuna salad for the holidays. Simple and easy it is, just place it on the can, push the button and either watch it do its thing, or utilize the time and get other things accomplished at the same time. There were no sharp edges on the lid or the can when it is finished. At times you have to snap the lid off the can as shown in the video, but in most cases it removes it 100% and lifts off when removing the opener and stays attached to the magnet. This is a battery operated product that takes two AA batteries that are not included, so no cords to fuss with. Great gift idea and a reliable product. We’ve Tried It and we love it! 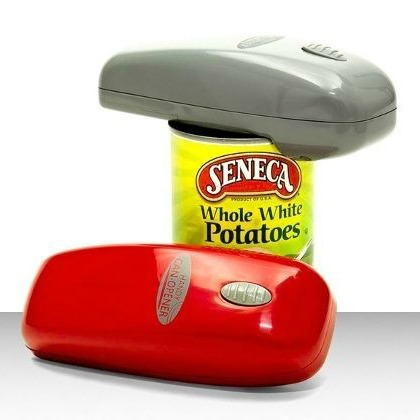 You can buy the Handy Can Opener for $14.95. It comes with a plastic base, an accordion style pump and a 101-egg recipe guide. Let’s get straight to it; I gave this thing a try on multiple occasions before making the video with no prevail. I really wanted it to work, but it just did not. Even though there are detailed instructions (literally a book) included, I know how to hard boil an egg and have been doing so for decades. My method is to place eggs in cold water with a tablespoon of baking soda, bring water to boil, cover and remove from heat for exactly 10-minutes and then place eggs in an ice bath to cool immediately. 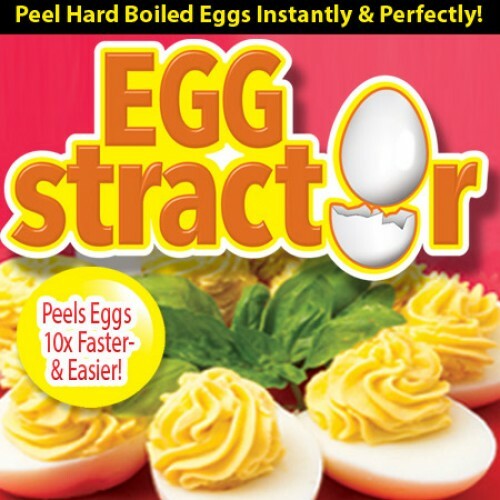 My eggs typically peel easily and without frustration, not in this case using the EGGstractor; it is a workout that takes longer than just peeling the eggs yourself. I even went out of my way and bought different types of eggs to be fair to this product, I purchased some from Costco, Target and Cub Foods during the trial period of having this; but still, I couldn’t get a single egg to come out as clean as I would by just peeling it by hand. It also claims on the box to be fun and easy. Watch the video below and ask yourself, does that look fun and easy to you? We’ve Tried It, and we will skip it. 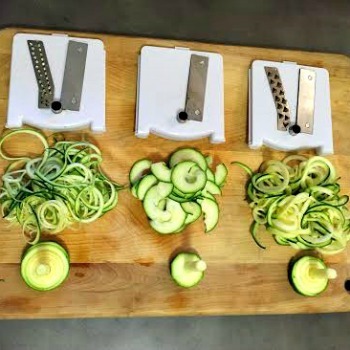 Spirooli Spiral Slicer Review: This is the latest As Seen On TV product that We’ve Tried It put to the test. Check out the video. 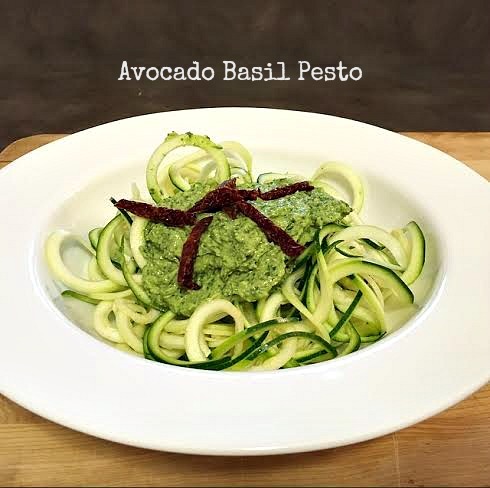 Not only will you get to see the Spirooli in action, you will also learn how to make Avocado Basil Pesto. Throw the first 4 ingredients into food processor. Process until everything is well combined. Mix in juice of half a lemon. Season with sea salt and pepper to desired liking. The sauce was a little too thick for my liking so I added about a tablespoon of olive oil. This is optional. 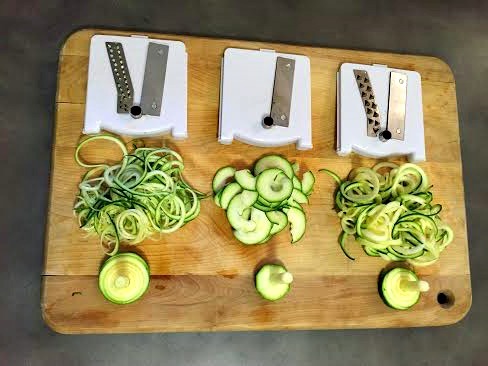 For the zucchini noodles, I just spiraled one med zucchini. I topped off this recipe with sun dried tomatoes. My Fun Fish Tank Review. Shirley ordered more As Seen On TV products! This time around she bought each of our daughters a My Fun Fish Tank. The product claims to be self-cleaning, which translates to no cleaning for the moms. My Fun Fish the aquarium that cleans itself like magic. Just add clean water and the dirty water flows out the cleaning spout. My Fun Fish Tank is always crystal clear and provides you fish with a happy, healthy home. My Fun Fish Tank as seen on TV will captivate your family’s imagination with an incredible water world. My Fun Fish Tank any room into an under-water world of discovery. Include My Fun Fish Tank, 1 white LED light, stones and plant. Fish not included. 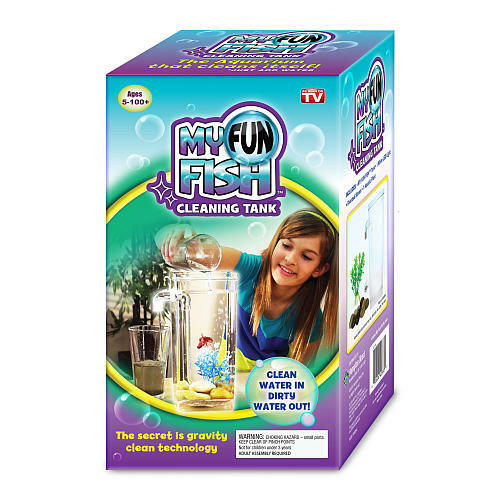 Although we seemed skeptical in the beginning of the video we would recommend buying the My Fun Fish Tank. It really was easy to clean and our daughters love it. For $14.95 you can’t go wrong! As Seen On TV Potato Express Review: Shirley was once again shopping in the As Seen On TV section of the store and ended up coming home with the Potato Express. We were happy with how the potatoes turned out when they were finally done. Even though it took a bit longer for them cook than advertised it is still very fast for cooking 2 large potatoes and they were done perfectly. In the oven it would have taken at least 45 minutes to bake. 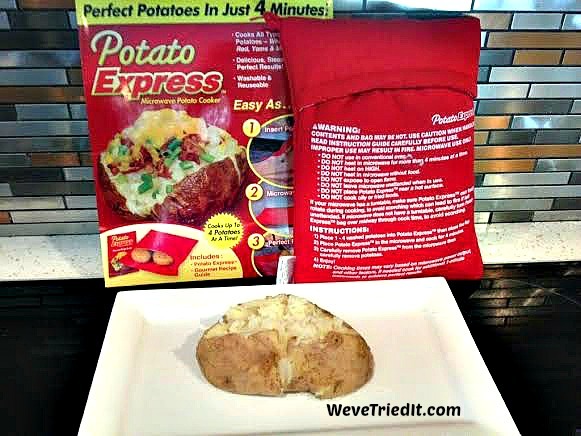 You can purchase the Potato Express here for $9.95. Have you seen any products lately you think we should try? Comment below and we will check them out. We must admit we were hungry when we ordered the Stufz Stuffed Burger Maker off of the television. We seem to get suckered into the As Seen On TV products way too often. Watch the video below and check out our review. You can’t go wrong with anything that has to do with bacon, right? We picked up the As Seen On TV Perfect Bacon Bowl at our local Target and decided to give it a try. Watch our video and see what we thought of the Perfect Bacon Bowl. Leave us a comment below if you have tried the Perfect Bacon Bowl and tell us what you thought! Today’s review: As Seen On TV Perfect Tortilla. We like a good taco salad and the idea of having a healthier option for our shell seems appealing. Check out our video and see if we would recommend the Perfect Tortilla. If you have bought this product, leave us a comment below and let us know what you thought! Today we tried out the As Seen On TV Air Curler. We brought in a hair model since Shirley and I have short hair. Thanks to Superstar Ninja Realtor Jenni Martin for being a part of our review! 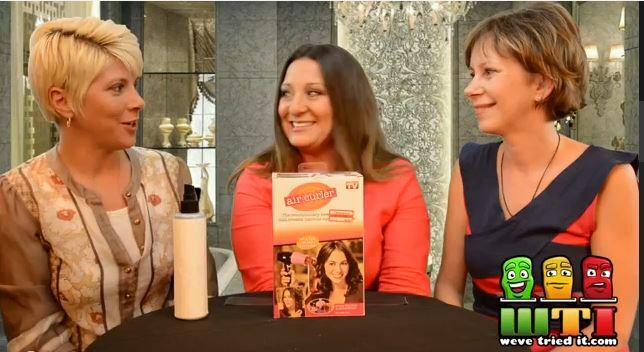 Watch the video and find out if the Air Curler worked for us! Shirley can’t get enough of the As Seen On TV products, this time we tried the Wax Vac. The WaxVac ear cleaner is described as a safe and effective way to clean and dry your ears! Watch the video below and check out our review. If you have tried this product leave us a comment below and let us know what you thought!